Apparently Jennifer Aniston is now a chicken keeper. Her new $21 million Bel Air home came with a coop (not a coupe) and several birds. Los Angeles allows 4 hens. Read more here. On October 22, 2010, I met the Chicago Tonight crew and Mary, the Columbia College student who is making a documentary about my urban chickens business at the house of Bruce, my client whose chicks were featured in the Wednesday Journal in July. Chicago Tonight interviewed us as I conducted a consult. Here are a few pix! The story airs on Monday, 11/22, at 7 PM on Channel 11. 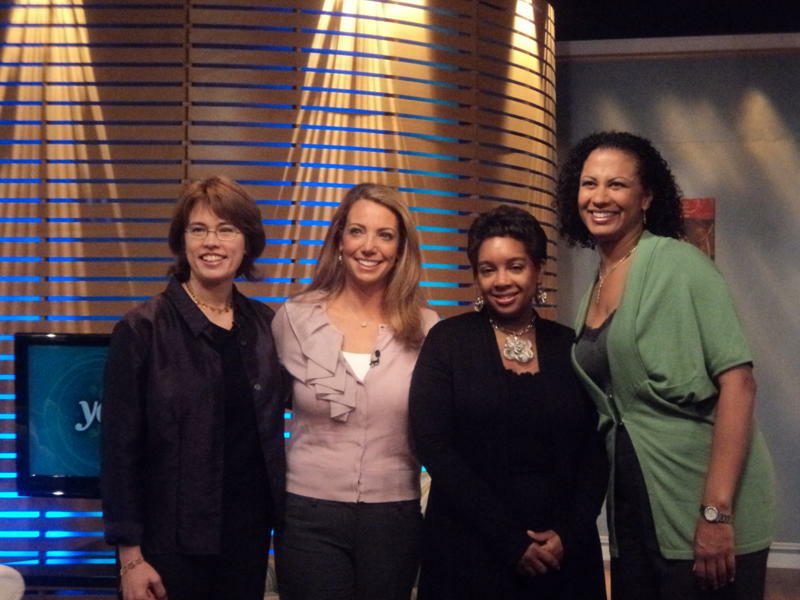 WCIU , Channel 26, pulled in two female entrepreneurs, Kimberlee Burt, owner of A Child’s Space daycare, and Chicagoland’s urban chicken consultant for a spot on You and Me in the Morning on 9/21/2010. I got up at 5:15, got dressed, did the hair, the makeup, and then loaded the cage into the back of a car I borrowed–not a good time for my vehicle to be in the shop! I was anticipating finding two sleepy hens who could be easily removed from their roosts, but no such luck. I tried persuading with food, water, and free-range time in the yard, but they weren’t cooperating. Finally I wrangled them out of the coop by pulling off the top cover and poking a stick to get them to move toward the entrance. With hair, makeup, clothes, and jewelry still intact, I headed to the studio. Once inside, I noticed that the hens’ feet were a mess, so I scrubbed them with wet, soapy towels. One of the hens is a singer–much too risky for live TV–so we put the chickens in Block B. The studio told me this was the first time they’d had live animals. It was a whirlwind show and quite random–Blago’s new gigs, the guy who balances stuff on his chin, day care, and chickens! The girls were very well behaved and even sat on the hosts’ laps! Check out Part I, the lead-in ,here. Part II, the show clip is here: Home to Roost’s and Jo Schmoe the Buff Orpington’s debut TV appearance. Dinosaur the Australorp also made an appearance (on Jeanne’s lap! ), but she’s not in this clip. The show went well, and the hens were very well behaved! A huge thanks to WCIU for this opportunity.